I’m not even sure where to begin with these books. From them, I’ve gained great insight and together, they have formed the foundation of my practice, teaching and discipleship. In search of the divine we go everywhere. We go to places of pilgrimage, visit temples, follow many paths and disciplines—and ignore our bodies. Your body is the most sacred place of pilgrimage you’ll ever come to. It is the dwelling place of the divine spirit; it is the temple of God. Go within and experienced the glory of God within you. Bapuji, Swami Kripalu, came to the end of his life in 1981. I was 10 years old at the time and hadn’t heard of him. I am forever grateful for his teaching stories and for those who so faithfully copied them for our use today. Swimming with Krishna is only one such book. In this little book are some of the most potent teaching stories. He tells the story of nearly drowning in the Narmada River and surrendering to the current. 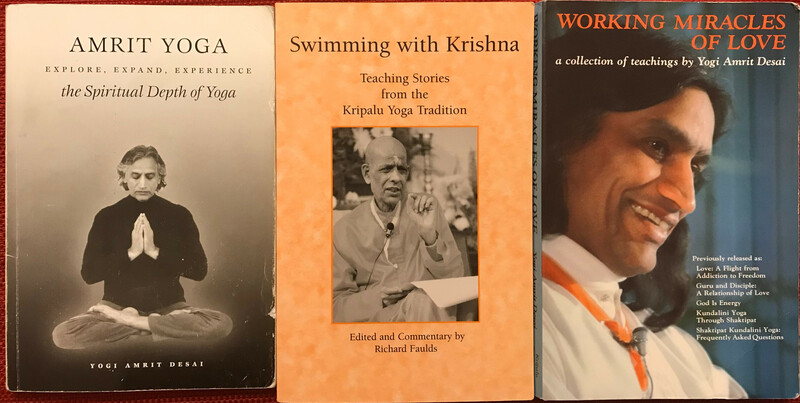 He tells other stories as well, such as his pilgrimage with Dadaji and, two of my favorites, Swimming with Krishna and the story of Eklavia but in my mind, the most powerful story in this book is of an umbrella. A small village was suffering from severe drought, it’d been three years since the last rain. The villagers decided to pray for rain. A 10 year-old orphan named Chapal went to his grandmother’s home and told her that he was going to pray with the rest of the village. As he was ready to leave their humble home, he asked “Where is my umbrella?” His grandmother told him where to find it and he left for the village square. Once they had gathered, one of the village elders spoke on the power of prayer and then all of the villagers prayed. “No one believed that the prayers would really bring rain, but no sooner had they begun their heartfelt prayer when a sudden flash of lightning crackled across the sky. It was followed immediately by a loud clap of thunder, and the winds picked up again to blow fiercely. “Within moments, the sky was filled with dense clouds, and everyone’s eyes were filled with tears. It was as if the prayers had come to life. Soon the rain was pouring down in torrents, and everyone started to leave. When you step on your yoga mat or sit on your meditation cushion or go to work or kneel to pray, be sure to bring your umbrella. This book has given me so much. There were only five copies in the shop and I’ve only seen it in the shop one other time. It isn’t an easy book to find. It confirmed in me the Love that I felt. It awoke in me a desire to serve that has never been quenched. No one can give you what you don’t already have. You could be the most loved person on this earth, but if you don’t love yourself, you will be miserable. Instead of artificially trying to draw love from others, first learn to accept yourself. Anyone can create the false feeling of acceptance and belonging by commanding it from some outside source, but only the person of true depth and maturity can find acceptance within. It also steadied my path as a disciple of this sacred lineage. An awakened person, who has grown beyond attachment, who has used the higher methods, who knows where your problems are, where your hurdles are, can remove them one after the other. But first you must surrender to that awakened person, to the guru. If you can surrender to a stone statue, that statue can become a guru to you. The question is: where can you surrender? Can you surrender to a God you cannot see? For most people that is difficult. But it is easier to surrender to a living person whose life commands your love and trust. Such a person is the guru. A guru cannot give you more than you think he is capable of giving. Even if he is God Himself, he is totally helpless if you don’t think he can do anything for you. It is you who is giving energy to God to become God. God is first within you, the guru is first within you. Unless you surrender yourself to him, unless you trust him, trust yourself, trust the guru within you, you will never truly grow. It is not the guru, but your surrender to him, your faith and trust in him, which are the primary ingredients for your growth. Receiving the disciple’s services is not the need of the guru. Giving service, however, is the need of the disciple.